Depending on the region where the cake also has its own unique flavor. Depending on the region of the south, the stuffing will be varied. Usually, there are shrimp, green beans and bean sprouts. 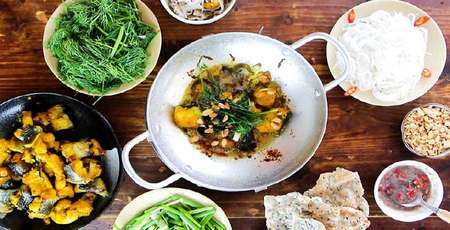 Although Muoi Xiem only appeared in Saigon, the restaurant has gradually become familiar to those who love the dish. The Chef has created nearly 30 different kinds of Banh xeo. 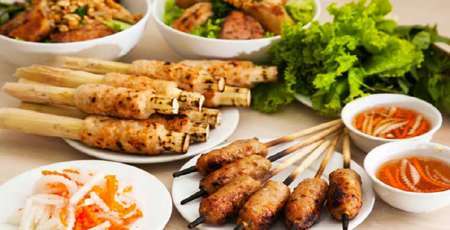 From the traditional one with shrimps and meat to different types of banhxeo with mushrooms, kimchi, abalone, white ginkgo biloba, coconut and many other types. Dinh Cong Trang Restaurant is the longest-established banh xeo restaurant in Saigon. 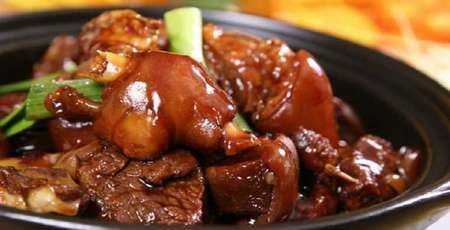 Therefore, the restaurant is known to many people and visitors are often far to come here to enjoy. Although the restaurant is very crowded, the staffs here still can handle everything to make sure any customer is served with the best service. Prices: 70,000 VND / normal portion and 100,000 VND / special portion. Address: 46A Dinh Cong Trang Street, Tan Dinh Ward, District 1, Saigon. 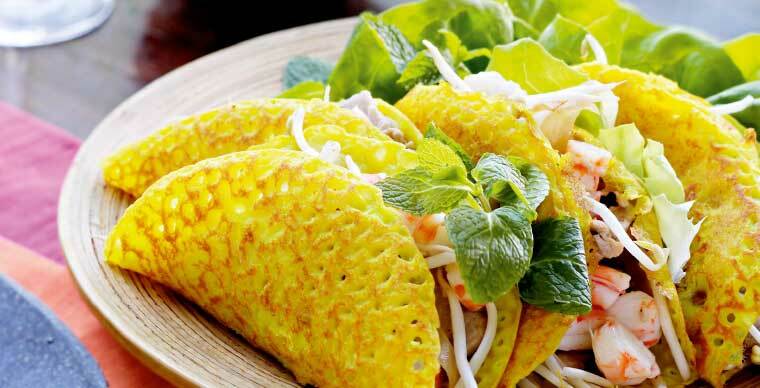 An laghien Restaurant has been making banh xeo in the style and flavor of the West of Vietnam. But the key to the success of this restaurant is in the combination of the ingredients. The restaurant has many kinds of banh xeo for you to choose from such as traditional banh xeo of banhxeo with mushroom, kimchi, lime and abalone, vegetable and shrimp etc. Address: 74 Suong Nguyet Anh Street, Ben Thanh Ward, District 1, Saigon. Phone: 093 341 88 44. With the special flavor of banhxeo you can find nowhere else, Ba Duong restaurant has had a reputation and foothold in the hearts of customers. 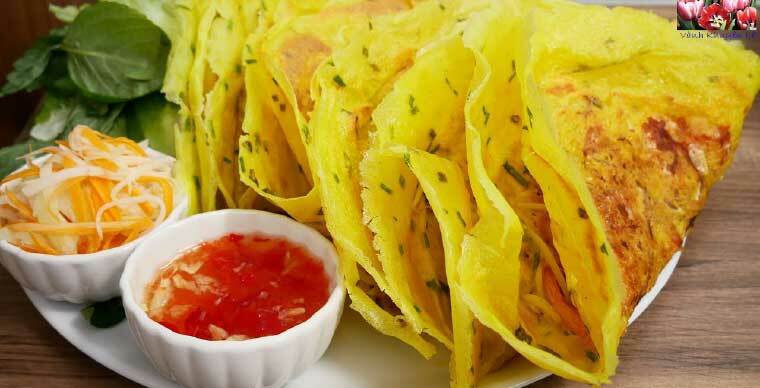 Banh xeo of the restaurant is offered to the guests with a beautiful yellow. The outside is crispy while the inside is soft and tender. Ba Duong restaurant has spacious space, airy and clean. Although the restaurant is located in the small alley so finding the restaurant is quite difficult, it is always crowded.. Address: Kiet 280/23, Hoang Dieu, Hai Chau, Da Nang. The banhxeo here is larger than the spread of adult hands being made from grain rice without using coloring. The special thing that makes the taste and quality of the cake is the shrimp. 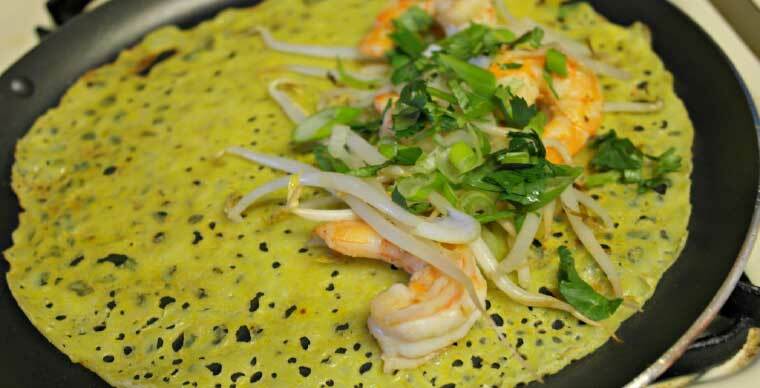 The shrimp used to make banh xeo is absolutely fresh that they still can “jump” before being used for banh xeo. That’s also the reason for the name “jumping shrimp” banh xeo. 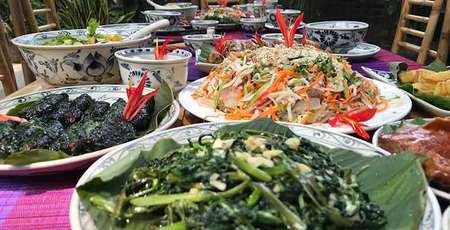 Another thing that makes this restaurant different is even when the restaurant locates in the heart of Da Nang City, Co Ba - Jumping Shrimp Banh Xeo Restaurant still chooses the style associating with the folklore culture. The main materials being used to decorate are bamboo in a large and airy space. Address: 248 Trung Nu Vuong, Hai Chau, Da Nang. Binh Dinh Duck Cake in Da Nang. The restaurant has quite spacious space, airy and clean. 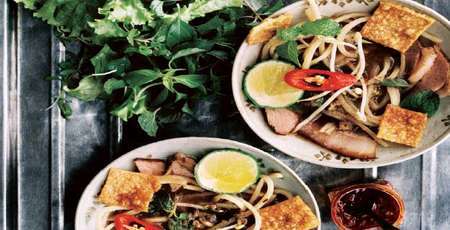 It is a special dish of Dai Loc in the heart of Da Nang. 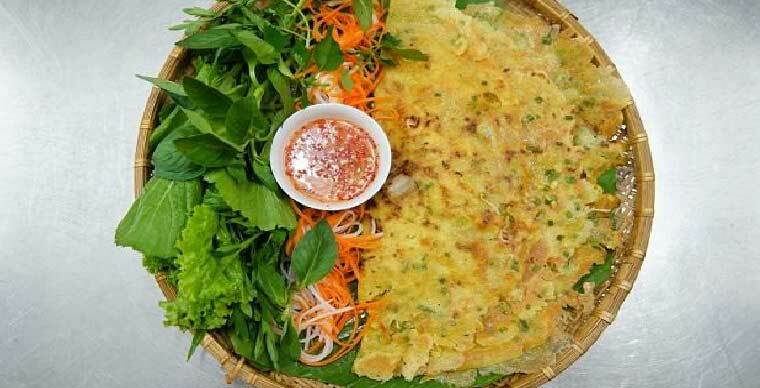 With its own delicious flavor, the banh xeo here has become the "favorite" dish of many diners in Da Nang. It’s cut into 6 pieces when being served on the table. 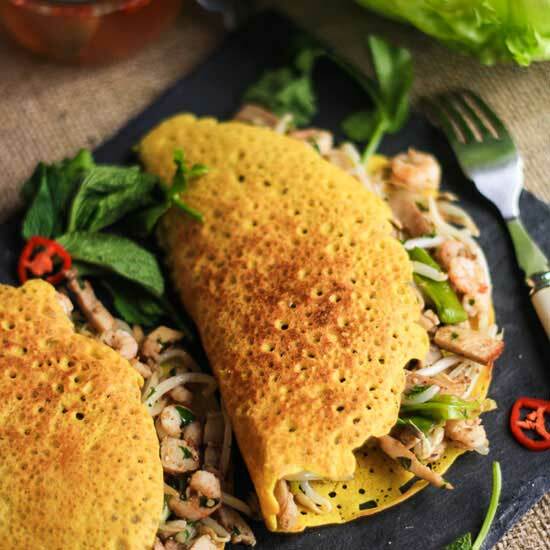 There are different kinds of banhxeo with different main ingredients such as pork, shrimp, eggs etc. 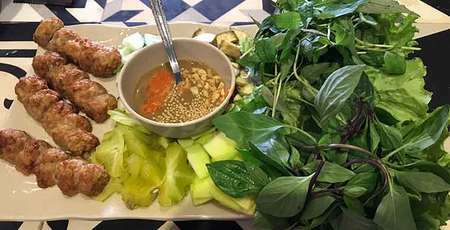 The dish is served with a variety of green vegetables, herbs and a typical dipping source from Dai Loc. Address: 103 Le Thanh Nghi, Hai Chau, Da Nang.